“I only want to play cartoon music!” That was the pre-condition my older son made at age seven for being willing to begin piano lessons. He loved music, having become a fan of the Empire Brass Quintet after seeing them on Mr. Roger’s Neighborhood on TV, and was waiting eagerly until he was old enough to toot a trumpet. But learning something about the basics of music in the meantime by taking piano lessons — that he wasn’t sure about. So he made his cartoon-music demand. Luckily, we had found a wonderful piano teacher in our neighborhood who came highly recommended by other parents as someone who was terrific with young kids. She won him over, first by watching his favorite cartoon show, transcribing its theme song, and teaching him how to play the tune. She was also up to his second demand: In addition to cartoon music, he was willing to play sports music, which at that time meant to him “The Star-Spangled Banner” and “Oh, Canada” — hockey fan that he was. So she found sheet music and taught him those tunes as well. At that point, he was beginning to enjoy playing tunes on the piano, had come to like and trust this patient teacher, and decided he’d be willing to play the pieces that she wanted him to play. He was on his way. He continued to take piano lessons up through high school, while also studying trumpet. He still plays piano nearly every day, a big help in writing music as a doctoral candidate in music composition. I was reminded of this piano teacher’s calm, sensitive approach to her initially reluctant learner when I read about the recent study by Harvard economist Raj Chetty and others which demonstrated the enormous impact a good kindergarten teacher can have on a student’s future life choices and earning power. No less important, I thought as I read about the study in The New York Times, are a youngster’s first music teachers. I was not as lucky as my son, having a screamer as my first piano teacher, someone who made me terrified of playing a wrong note, a fear that hampered my enjoyment of playing piano even after moving on to different instructors. I struggled along for several years of lessons, but quit during high school, not starting again until many years later when I saw what fun my sons were having with their piano teacher, who was willing to give me lessons, too, and help me discover the fun of plunking away on a piano. Hitting it off with the first teacher is a plus, but the opposite doesn’t have to be a career-ender. There were many other reasons why I never became a terrific pianist besides having an overbearing first piano teacher. Pianist Wu Han, who is now Artistic Director (with her husband David Finckel) of the Chamber Music Society of Lincoln Center, told me that she was only lukewarm about piano during her first years of piano lessons as a youngster growing up in Taiwan. But at age 13 she got a new piano teacher who persuaded this young teen that she was pretty good at piano and turned her around. As Wu Han explained to me, “You need to have somebody to have faith in you, to make you believe you can do something fantastic.” The trick is to try to find such a person for a youngster’s first music teacher. 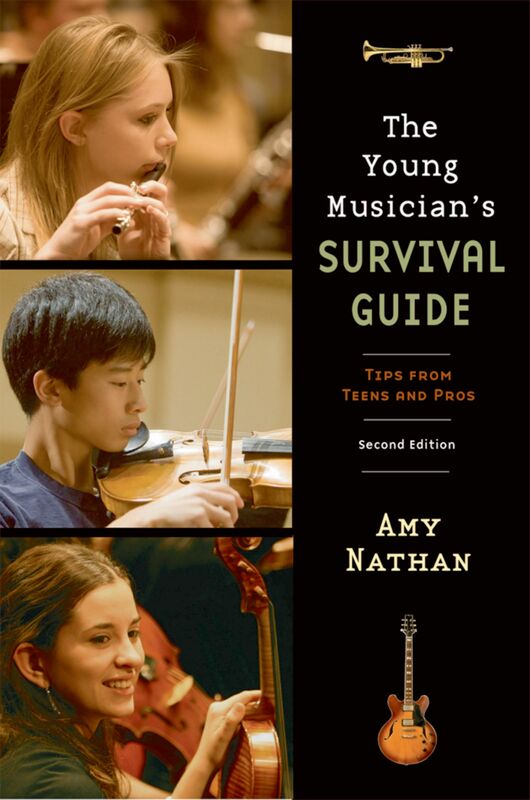 Amy Nathan is the award-winning author of several books for young people, including The Young Musician’s Survival Guide, Meet the Musicians, Meet the Dancers, Count on Us, and Yankee Doodle Gals. A Harvard graduate with master’s degrees from the Harvard Graduate School of Education and Columbia Teacher’s College, she is an ever-struggling piano student and has two musical sons (who inspired her to write her books on music for young people): one a composer and a trumpeter, the other a saxophone-playing political science graduate student. Another idea that has worked really well for me over the years is to have very different types of recitals, because as a musician myself who plays classica, jazz standards, Soutern Classic Rock and Blues as well as church music that you never know what kind of music a child will fall in love will later. They need exposure to many scenarios. I do a very formal recital once a year with only classical music and formal dress including long gowns for the women and girls and tuxedos for the men and boys. Next is a Halloween recital where students can play “spooky” pieces or anything else they want to as long as they wear a costume. The audience members are invited to costume too. I also do a Holiday Recital with holiday music and dress. This year I’m adding a Jazz Recital. These recitals include all ages and levels of music.They love it and can’t wait for the next performance.